At KANDOR Graphics we believe that the best thing about knowing something is sharing it. 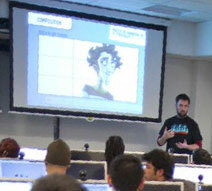 And we demonstrate that by training the future generations of 3D animators. It is a challenge and an opportunity, both for us and them. The information society in which we live is a huge platform for creation and launching of animated, computer generated images (CGI). There are more and more animation series and films each day, but 3D animation is not only limited to this use, it is also used to create 3D models in games. Consequently, the boom in demand for professionals with technical and artistic skills has skyrocketed. A demand for not only general 3D artists, today you need more specialized artists who can cover the various work areas necessary to implement projects in fields such as advertising, television, film and entertainment in general. To respond to this growing demand, we have designed a 3D Animated Character Master program to provide specific training, and focusing completely on the future professional advancement of the participants. It is our intention to train professional animators capable of covering the needs of this new and specialized market and who, upon finishing the Master program, can step straight into the professional field. Professional guidance of the contents and work methods. Teaching what is really needed, taking into account the demands and dynamics of a real production. Use of the latest professional tools and techniques. The creation, within the Master program, of a demo reel to be used as a student’s cover presentation.